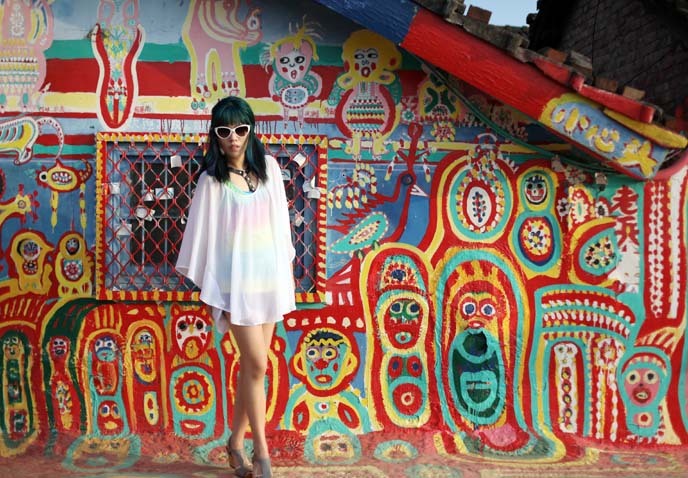 Taichung Rainbow Village: crazy, colorful painted houses in Taiwan! As a travel writer, I do my best to seek out obscure and offbeat places. 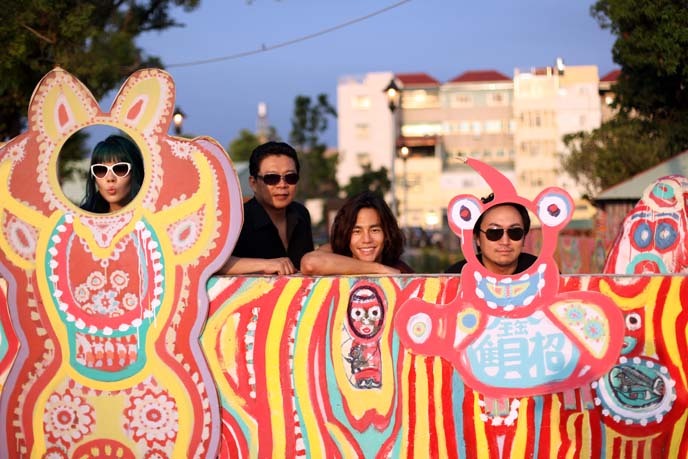 For this reason, I went out of my way to visit Taichung’s Rainbow Village with my friend Boris Tsai. 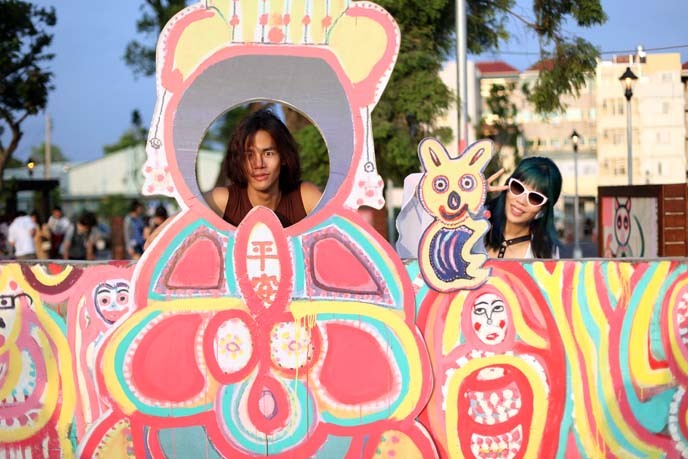 The photos say it all: this attraction is a total LSD trip! 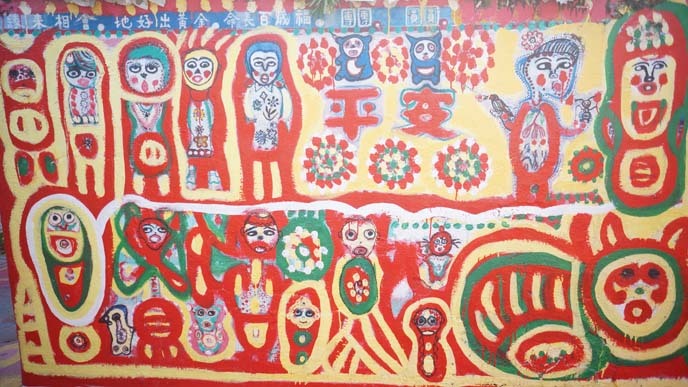 The “Rainbow Family Village” consists of several old buildings and paths, with every surface coated in vivid, primitive strokes. What’s the story behind these colorful paintings? Who made them, and what drugs was this person on? Let’s find out. I was staying in Taipei, at the Humble House hotel (remember my photoshoot here?). Taichung is another major city, located about two hours south. To get here, I recommend either driving (as we did), or taking a train and then a taxi. Taichung is rather spread out, and public transportation isn’t conveniently located near the Rainbow Village. The directions are a little tricky. If you’re in a taxi, show your driver the address in Chinese (written below), and have him plug it into the GPS. This tourist attraction is small, and it won’t take you more than 15-30 minutes to explore it. I wouldn’t go out of my way to come here, but if you’re already in Taichung, it’s an opportunity to see weird and wonderful local art. Boris and I were perplexed by these figures — human, animal and supernatural — surrounded by swirls of color. What a distinct style: modern meets primitive, with a touch of Taiwanese tradition. The walls are a superb backdrop for modeling. We were here to shoot images for Hong Kong Express Airways magazine, where I have a regular column. Boris wears Rick Owens wool pants with drawstring, a Rick Owens tank top, and Rick Owens high top shoes. I’m wearing Camper sandals, and a sheer white flowing top from Show Me Your MuMu. They also make a blue-white tunic and watercolor flowers cover-up. The characters ranged from old people to panda bears. 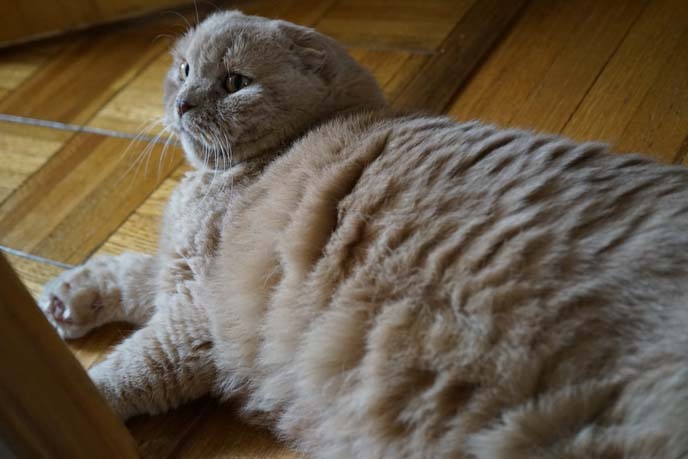 Doesn’t this little guy look like my Scottish Fold cat? They have the same short legs, tiny ears and round body. 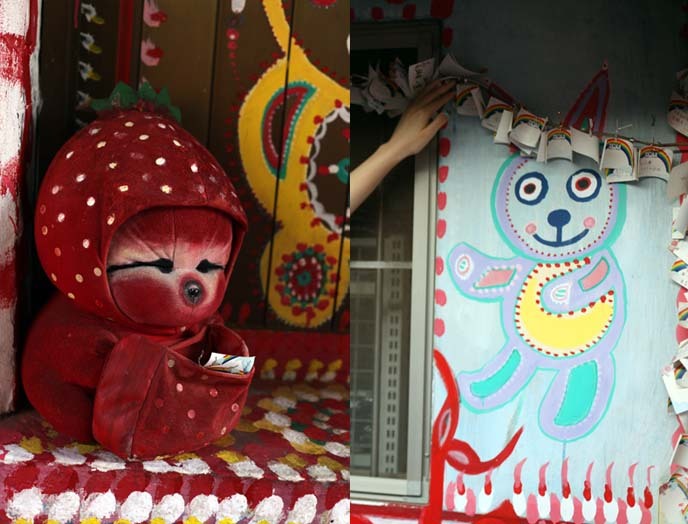 You’ll never guess who is responsible for this bizarre art… a 91 year old grandfather! Grandpa Huang was born in Hong Kong, and lived in these dilapidated buildings that were initially built for WWII veterans. 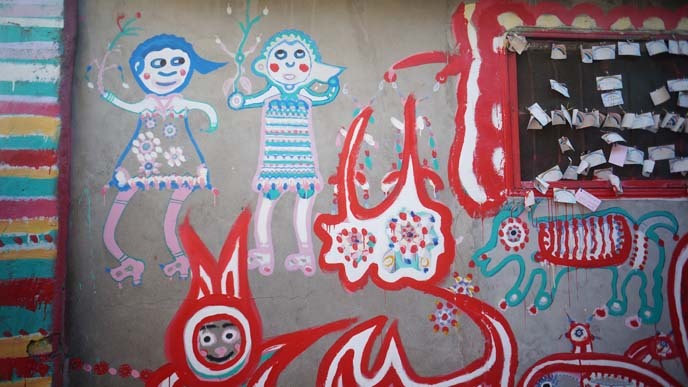 He had time to kill, so he bought paint with his pension, and started to transform the old walls into rainbow murals. Grandpa Huang is a self-taught artist who painted out of passion — he wanted to inject color into this worn-down neighborhood. Before long, students at a nearby university discovered the ever-expanding Rainbow Village. They took pictures of his works, posted them online, and they went viral. Today, this little settlement is one of Taichung’s most popular tourist attractions. 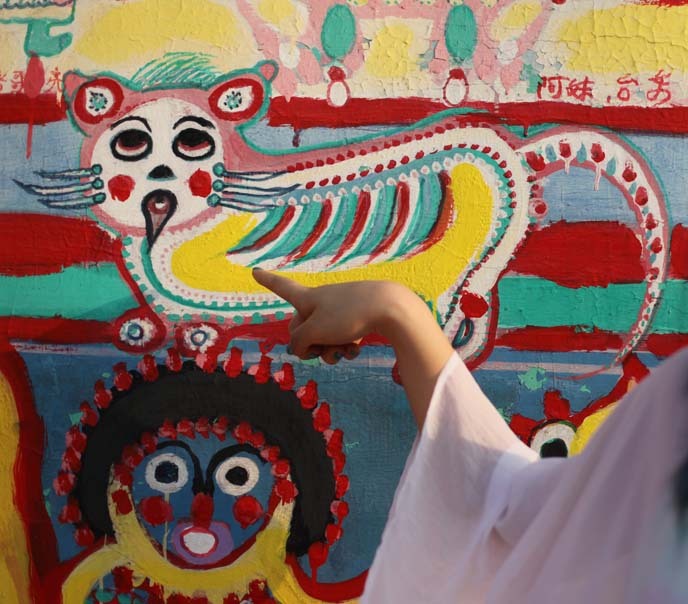 People come here to read the positive messages on the walls, and pose with the spirited paintings. 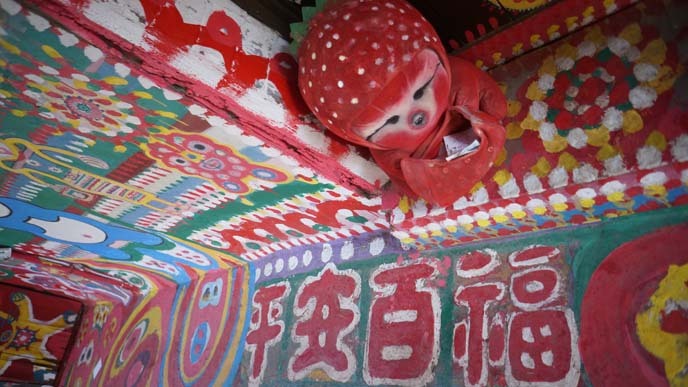 The Taiwanese government had originally planned to demolish the Rainbow Village. However, locals started a petition, and the area is now preserved (hopefully for the long run). We saw a small souvenir stand where you can buy drinks and Popsicles, and small souvenirs. It’s an easy way to support the Rainbow Village and its aged caretaker. Sweet and slightly demented: that’s my kind of place! The “acid trip” feeling of the Rainbow Village inspired us to get a little crazy with our poses. 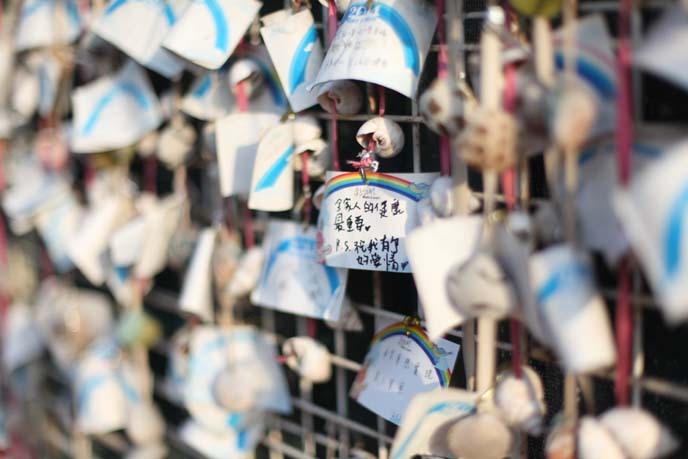 Visitors write wishes on these notes, and hang them along with seashells on the windows. My wish to visit Taiwan and reunite with my friend certainly came true! Pretending to be the Chiefs of the Rainbow Village. All photography by Jacqueline Kwok of noircorner, and Ken Yuen. We didn’t see Grandpa Huang that day, but he still touches up the paintings daily. Children love to see his works in progress. 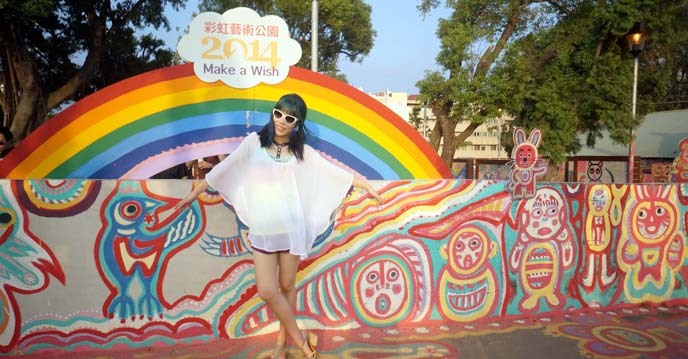 Come make a wish at the Taichung Rainbow Family Village. 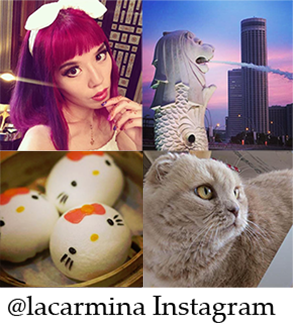 The nearby Dawncake (a gifts and snacks building, featuring Miyahara tea-flavored ice cream) and Taichung Night Market are also fun to include in a day-trip. And you can’t leave without taking a funny photo with the cut-outs! Are you intrigued by the Rainbow Village? Do you seek out local oddities when you travel, like I do? 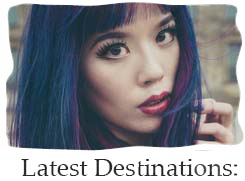 … and you can always see on-the-go snaps from my travels on my @lacarmina Instagram. I’ll be back in Asia soon, and you’ll be able to see what mischief I’m making! Fabulously weird like all you do brilliantly. This is so beautiful and unique! You look fabulous. The art is truly weird, colorful, unique. I loved to know the history behind it. Thanks for the great post! Oh, Boris looks hot, his clothes are great. AMAZING photo series! You guys look great! Love this! Can’t wait to take pics with you in asia! 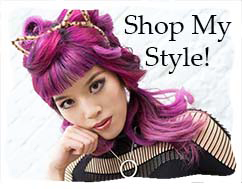 Really soooooo fabulous !!! 0h i love your job !!! You did great awareness pics of Rainbow Village !!! This sooo!! Alwats lookin for unique Rainbow related stuff for my Daughter::******* EleanaRainbow:)*******esp as saw Double Rainbows everyday !!!!! the week she born in July in Colorado “!!!!! !”: whee!!!! Glad you like this, and hello to rainbow! It looks beautiful! And they love your kitty! I went there last year in Dec, the place’s awesome! It’s the most fabulous place on earth. The story of that place is truly beautiful. I hope to visit one day. I’ve heard about this town, and really want to check it out! I hope you had a great time in Taichung.